SlingShot — a reverse bungee ride where passengers are propelled over 100 metres at speeds in the region of 160 kilometers per hour. The machine does not utilize rubber ropes or bungee cords as in a slingshot, but is powered by a patented spring propulsion device incorporating up to 720 specially-designed springs. The SlingShot can be custom designed to cause minimal disruption to existing venues. Funtime operates a small amusement park in the centre of Surfers Paradise, aptly named Funtime. The park features installations of their Sling Shot and Vomatron rides. The park was previously known as Adrenalin Park and featured several other rides and attractions, including an Intamin Parachute Drop tower, a mini golf course and a bungee tower. ^ a b c Slind-Flor, Victoria (27 August 2010). "Cedar Fair's New Thrill Ride Infringes Patent, Funtime Claims". Bloomberg. Retrieved 27 April 2012. ^ a b c "Sling Shot (Funtime)". Parkz. ^ a b c d "Vomatron (Funtime)". Parkz. ^ a b "Funtime". Parkz. Retrieved 27 April 2012. ^ ‹See Tfd›US patent 7666103, ‹See Tfd›Walter Pondorfer & Laurence Ross Petrie, "Amusement ride", published 27 October 2005, issued 23 February 2010, assigned to Cottingham Agencies Ltd.
^ Fogarty, Steve (25 August 2010). "Cedar Point's new ride a swing at variety". Chronicle Online. Retrieved 27 April 2012. ^ "The Bell". Funtime. Retrieved 27 April 2012. ^ "Chaos Pendle". Funtime. Retrieved 27 April 2012. ^ "Rocket". Funtime. Retrieved 27 April 2012. ^ "Sky Diver". Funtime. Retrieved 27 April 2012. ^ Jackson, Jerry W.; Kassab, Beth (23 January 2006). 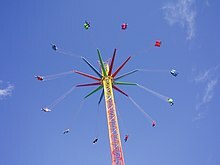 "StarFlyer takes riders for a twirl". Orlando Sentinel. Retrieved 27 April 2012. ^ "Tornado". Funtime. Retrieved 27 April 2012. ^ "About Skyfall". Funtime. Retrieved 27 September 2013. ^ a b "Officially the world's tallest Star Flyer!". Park World Magazine. Datateam Business Media Limited. 13 June 2013. Retrieved 11 July 2013. ^ "The Stars Align In 2017 For New Thrills At Valleyfair!". valleyfair.com. Retrieved August 21, 2016. ^ a b MacDonald, Brady (1 September 2011). "Six Flags unveils new attractions for every park in 2012". Los Angeles Times. Retrieved 27 April 2012. ^ "Six Flags Over Georgia and Six Flags White Water Announce New Thrills for 2013" (PDF). SixFlags.com. Retrieved August 30, 2013. ^ MacDonald, Brady (12 April 2012). "Steel Pier expansion moves forward minus diving horse act". Los Angeles Times. Retrieved 27 April 2012. ^ "Texas SkyScreamer" (PDF). SixFlags.com. Retrieved August 30, 2012. ^ MacDonald, Brady (9 February 2012). "Galveston Pleasure Pier brings thrill rides back to Texas coast". Los Angeles Times. Retrieved 27 April 2012. ^ Mayné, François (22 January 2012). "La Ronde annonce Vol Ultime pour son 45ème anniversaire". NewsParcs (in French). Retrieved 27 April 2012. ^ "Unknown Parachute Drop (Magic Mountain)". Parkz. ^ Tuttiett, Henry (25 September 2010). "Coast's Adrenalin Park to close". Gold Coast Bulletin. Retrieved 27 April 2012. Wikimedia Commons has media related to Funtime Star Flyers.